امیدخواه, عاطفه, خواجه ای, سایما. (1393). چهارچوبی برای احیای محله : شش ترکیب از چهار مؤلفه. مجله علمی-ترویجی منظر, 6(27), 68-74. عاطفه امیدخواه; سایما خواجه ای. "چهارچوبی برای احیای محله : شش ترکیب از چهار مؤلفه". مجله علمی-ترویجی منظر, 6, 27, 1393, 68-74. امیدخواه, عاطفه, خواجه ای, سایما. (1393). 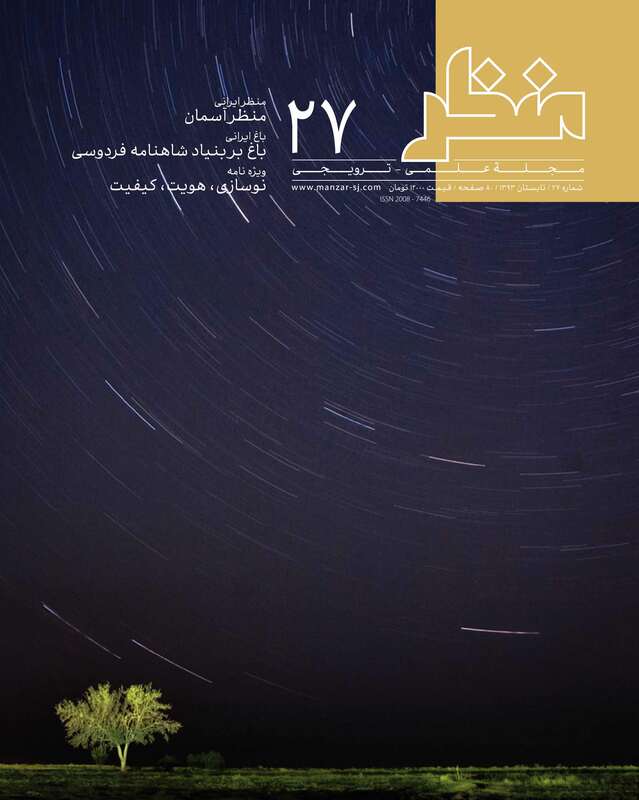 'چهارچوبی برای احیای محله : شش ترکیب از چهار مؤلفه', مجله علمی-ترویجی منظر, 6(27), pp. 68-74. امیدخواه, عاطفه, خواجه ای, سایما. چهارچوبی برای احیای محله : شش ترکیب از چهار مؤلفه. مجله علمی-ترویجی منظر, 1393; 6(27): 68-74. از جمله عوامل موفقیت در احیای محلات می‌توان به افزایش جمعیت، کاهش میزان رکود در محله، افزایش ارزش خانه‌ها و تغییرات بنیادی اجتماعی اشاره کرد. چالش‌برانگیزترین موضوع در احیای محلات، نحوه انجام فرآیند احیا و تجدید حیات است. در این مقاله سعی شده است، به ارایه یک چارچوب مؤثر در سازماندهی، هدایت اقدامات نوسازی وموفقیت فرآیند نوسازی پرداخته شود. این چارچوب دربرگیرنده چهار مؤلفه ـ کالبدی، اجتماعی، داخلی و خارجی ـ است و با توجه به تداخل و اثرگذاری متقابل این مؤلفه‌ها شش دوگانۀ اساسی در موفقیت نوسازی معرفی کرده است. با توجه به چارچوب مطرح شده، با تعاون و همکاری در راه بهبود کالبدی و شرایط اجتماعی واحد همسایگی، کیفیت زندگی اقتصاد فردی شهروندان مانند اشتغال‌زایی، آموزش و درمان شهروندان نیز بهبود پیدا می‌کند. با این همه، یکی از مزایای این چارچوب، این است که می‌تواند به صورت همزمان با سایر راهبردهای ارتقاء احیاسازی واحد همسایگی به کار رود. در نتیجه در به کارگیری چارچوب حاضر، علی‌رغم ساده و کلی بودن، مکان‌هایی با ویژگی‌های بسیار متفاوت می‌توانند از رویکرد مشابهی پیروی کنند، اما بر این اساس راهکارهایی که در زیر دسته‌های شش دوگانۀ قرار می‌گیرند باید با شرایط انطباق پیدا کنند. This “Policy & Planning Brief” introduces a framework that can be used to guide neighborhood revitalization efforts. Using the framework may help to ensure that internal and external stakeholders are considering both the physical and social needs of the neighborhood. Additionally, the framework should encourage communication between stakeholders, and implementation of revitalization strategies. What makes for a successful neighborhood revitalization effort? There are a number of potential answers to this question, such as an increase in population, a decrease in blight, an increase in home values, and fundamental social change (Dorius, 2011; Galster, Temkin, Walker, & Sawyer, 2004; Weber & Smith, 2003; Schill, Ellen, Schwartz, & Voicu, 2002). But perhaps the more challenging question is how to make revitalization happen. A number of strategies have been proposed including asset building (Green & Haines, 2012; Kretzmann & McKnight, 1993), place-making (Project for Public Spaces, 2013), and strategic or targeted reinvestment (Galster, Tatian, & Accordino, 2006). This “Policy & Planning Brief” proposes a new framework that can be used with existing strategies to organize and guide revitalization efforts. It consists of four components – physical, social, internal, and external – that interact with one another to help produce positive neighborhood change. Before discussing the framework itself, it is necessary to discuss the individual components first. There may be a concern that this framework is too general or simple to work. However, it is necessary to keep in mind that any framework for a best practice must be general enough to be adaptable to different places facing a similar set of conditions. In general, strategies for neighborhood renewal should be based on recognition that the maintenance of healthy neighborhoods requires a multifaceted approach that is flexible enough to take into account the specific needs of individual neighborhoods and their capacity to respond With this framework, places that are very different can follow the same approach – but adapt the strategies that fall under the six essential pairs accordingly.